Ear protection is an article of personal protective equipment (PPE) that safeguards the wearer against hearing damage from overexposure to loud environments, and also prevents the ingress of debris and water into the ear canal. Earplugs and earmuffs are the most common types of ear protection. 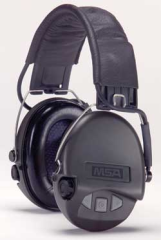 PPE designed for ear protection primarily functions by insulating the ear canal with soft, muffling material. The material reduces the amplitude of sounds waves transmitted to the ear drum, which when too loud or recurrent damages the ear drum, causing decreased auditory perception and possibly deafness. Consistent exposure to loud noises is also shown to raise blood pressure, heart rate, stress levels, fatigue, and depression, with the severity of these factors varying based on the individual. Industrial noise is a major occupational health issue that is monitored by OSHA, state laws, and usually company and union policies. In any work area that registers an ambient noise of 85 decibels (dB), the OSHA action level, workers must be outfitted with ear protection. Typically, noise minimization strategies, such as enclosures or dampers, are used as well as ear protection, since noise is a common source of inefficiency. Additionally, ear PPE prevents against the intrusion of debris and water that might cause tissue damage, inflammation, or changes. Materials shavings in a woodshop or dirt in windy conditions are just two examples where foreign materials need to be excluded from the ear canal. Individuals who spend considerable time exposed to cold water also benefit from ear PPE that reduces the onset of exostosis, a medical condition that gradually constricts the ear canal. Ear protection devices can be categorized as plug type or earmuff-type. Earplugs are small components made of silicone, polyvinyl chloride, or polyurethane that fit into the recesses of the ear canal and outer ear; they are sometimes tethered. Earmuffs utilize cushioned pads lined with sound absorbing material to cover the entire ear. Earmuff pads are usually attached with a metal or thermoplastic headband, or are integrated into a hardhat or helmet. Earmuffs offer better protection than earplugs and can also provide thermal insulation, but are larger and more expensive. 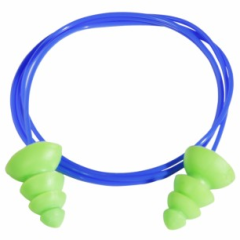 Earplugs can be worn inside earmuffs for optimal protection. Plugs: rest inside the ear canal. They may be compressed by hand, inserted into the ear and allowed to expand, or they can be molded to an individual’s ear topography for optimal comfort and fit. Porous plugs: made of porous foam, they allow some air flow so pressure inside the ear can equalize with ambient pressure, such as in aviation or diving applications. Button plug: permit clear transmission of sound, but at a significantly reduced volume. These typically have a hard shell with a membrane that enables sound transmittance. Noise reduction rating (NRR) is an estimate of how much an ear protection device lowers noise exposure and is provided by manufacturers. To determine the NRR, first the work zone’s ambient decibel level, either A-weighting or C-weighting, must be known. A-weighting is the decibel level perceived by humans, as many low frequencies are unperceivable. C-weighting is the true decibel level. Disposable: ear plugs are typically inexpensive, so are discarded for hygienic reasons, rather than cleaned. Earmuffs are not disposable, but may utilize interchangeable, disposable pads or cushions. Industrial noise is a major occupational health issue for people who are forced to work in loud work environments. OSHA, state laws, as well as company and union regulations try to mitigate and control industrial noise. Any area that has an ambient noise level of 85 dB or higher, the OSHA "Action Level", then anyone in that area must wear ear protection. Ensuring workers are wearing ear PPE correctly is a primary challenge. OSHA—What constitutes an effective hearing conservation program? MSA | New Pig Corp.